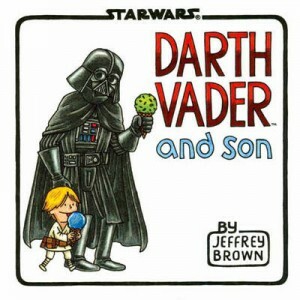 I figured Jeffrey Brown had exhausted the Star Wars novelty with his boy- and girl-themed books for children and their Star Wars-loving parents. If you haven’t already seen them, fallen in love with them, and given them as gifts to any and all of your friends with young children, Darth Vader and Son and Vader’s Little Princess present an alternate universe in which Luke and Leia grow up with their dark side-hugging dad. Luke and Leia see and treat Vader not as an evil, chokehold-dishing-out doer to be feared, but as their father—a guy who’s increasingly being worn down, wearied, and bemusingly befuddled as he tries to navigate the challenges of parenting. The results are some fantastic scenarios that both reference the film while marrying the nods and winks with some situations all too recognisable to parents. 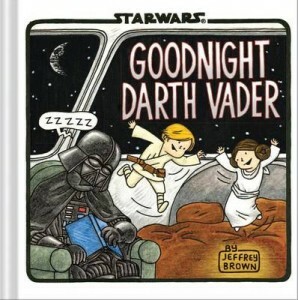 Brown’s back with Goodnight Darth Vader, proving I know nothing about novelty and that some concepts really have legs. But I should have expected as much from Brown and his stellar publisher, Chronicle Books, which seems to have a knack of finding and publishing top-notch books. Picking Goodnight Darth Vader up, I assumed it to be piggybacking off the Go the F*ck to Sleep book that took the interwebs, tired parents, and bemused people without kids by storm a year or two ago. But it’s not, weaving a rhythm and theme all of its own. The book is ‘Episode Eight PM’ writ across the page in the iconic yellow running text that’s the hallmark of the films’ openings. Vader has commanded Luke and Leia to go to bed, but the knee-high twins have other ideas. Meanwhile all the creatures and droids in the Star Wars universe are preparing for bed, and there are some fantastic good-night scenes and film nods. My favourites include the battle droids taking an interminably long time to say goodnight (‘Roger Roger’, ‘Roger Roger’). Meanwhile General Grievous, with his extra limbs, gets ready for bed four times faster than anyone else. The Millennium Falcon is wished goodnight with the play on the adage with ‘Don’t let the space slug bite’, while the Ewoks determine it’s easiest to sleep ‘when the Empire’s been silenced with rocks’. Goodnight Darth Vader is one for the collection for adults and kids alike, with the illustrations and text providing dual-level entertainment. Without giving my Christmas shopping plans away, it’s safe to say this book will be making an appearance in my gifts-to-give list for friends with young children. his books manage the holy-grail feat of impressing both adults and kids. I’m writing, of course, about Brown’s Vader series. The first, entitled Darth Vader and Son ( I have to say I think Vader and Son would have been a stronger title), I’ve blogged about previously. It’s based on the premise that instead of not encountering Luke until he was an adult, Vader instead raised him on the Death Star. 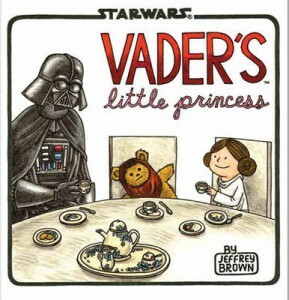 The follow-up, Vader’s Little Princess, is the daughter-themed equivalent, with Vader experiencing all the love and enduring all the quirks that come with that gig. The scenarios are recognisable to parents and non-parents alike, but given a peculiarly fantastic Star Wars-themed twist. Let’s be honest, these books are pretty much the best thing nerds and nerds who’ve become parents could ask for (and that’s not even including how much these books appeal to kids). and when Leia takes Vader to the ballet featuring—wait for it—Jar Jar Binks (it wouldn’t be a Star Wars spoof without a Jar Jar Binks joke). I don’t find Vader’s Little Princess quite as entertaining as I do Vader and Son, although whether that’s because Brown understandably used up his best material in the first book or because the element of how-cool-is-this surprise was gone the second time around. But I do find it great enough to warrant reading occasionally and recommending and gifting to friends more often than that. I’m not sure if there’s room for a third book in the series—maybe a Vader as grandparent title?—but I truly hope so. In the interim, these two are going to remain my parents-and-kids gift-giving staple.